At the moment right before a collision, it might not appear there is anything that can be done, but by slowing down, enforcing habits that promote safety and alertness, truck drivers can be the shepherds of the road and do their part to keep the roads safe. Every year the United States and Canada is pounded by snow, and there are always plenty of accidents. Some of them are not avoidable, but in many cases, they are preventable. The aim of this article is here to show everyone – car drivers, truck drivers, safety managers, and warehouse attendants – can do their part to ensure that the roadways are safe this winter. Fleet managers should know how to keep changing winter weather conditions in the back of their minds. The United States is staggeringly different depending on where you are, so anticipating the weather on truck routes is essential for drivers and fleet managers when planning routers, delivery times, and safety precautions. If a company does not have in-house weather technology, using websites, like weather.com, is an adequate substitute. However, relaying that information to a fleet is difficult, and even the smallest fleets should invest in a modern navigation device with live weather updates. In mountainous areas of the country, weather changes frequently. On one side of the mountain, there can be clear skies and warm weather and on the other a massive whiteout. 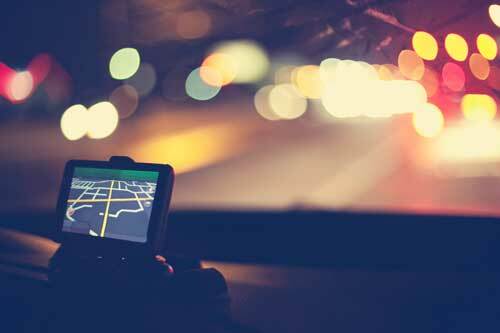 A navigation device will let a driver know what dangers are ahead. In addition to navigation devices providing updates, CB radios offer peer-to-peer updates for what’s ahead. During a storm or striving on icy conditions, listening to ESPN radio or your favorite comedian on Sirius XM, can be hazardous. It’s far better to be prepared and focus on the road when conditions are treacherous. Doing proper inspections are mandatory for drivers, but everyone in the warehouse and truck yard should have their eyes open. 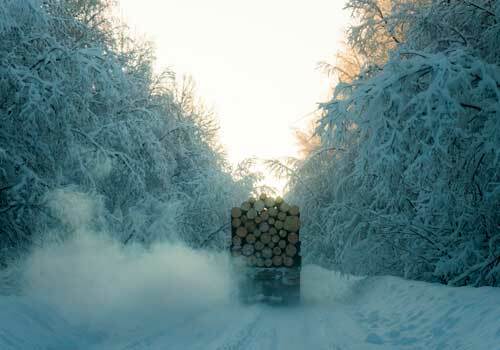 In the winter, trucks are covered with ice and snow, making damage difficult to spot. It’s important to keep a watchful eye in the yard for any kind of damage before a driver leaves. Using an ELD with a smartphone application can eliminate ambiguity with DVIR reports. Take as many pictures as possible and store them in the smartphone and backend web portal. Keeping track of any damage and fixing it immediately is a major key to keeping the winter roads safe for drivers. Mixing “black ice” with high-speed trucks is a recipe for disaster. Whenever there is a chance of ice buildup, snow tires should be used instead of summer tires. 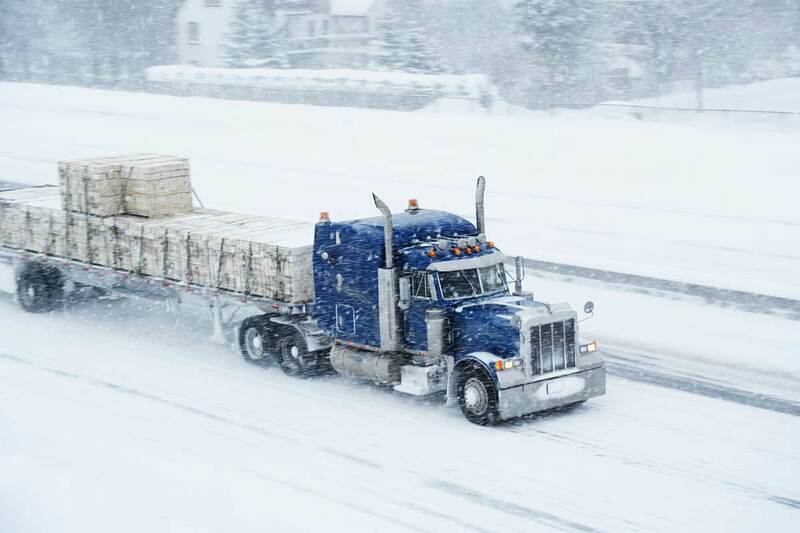 Truck drivers in mountainous areas know the benefits of using snow tires and chains. In many cases, they‘re mandatory fixtures for cars and trucks on certain roads and conditions. It’s best to keep them in the truck cab at all times. When a winter disaster strikes, drivers can run into situations where their ability to survive in cold temperatures is tested. It’s vital for drivers to have a winter survival kit with all the necessary refinements to keep warm, fed, and in constant communication with the home office and police if necessary. It may be lonely driving all alone, but it’s safer than driving in heavy traffic with icy roads. Staying away from other vehicles will obviously reduce the risk for accidents, so keep a healthy distance. The shoulders are also not a good place to be for breaks. Keep all breaks to rest areas, trucks stops, and parking lots. Minimize the occurrence of accidents by avoiding congested areas in slippery conditions. This makes the alertness of the driver paramount to spot possible accidents prior to them happening. This kind of precognition is not fool-proof, but something that comes with the experience of driving in harsh conditions for years. New drivers beware. Engine brakes, a.k.a. Jake brakes are great for saving brake pads but dangerous during icy conditions. Engine brakes create friction within the engine to slow the truck and are not designed for icy terrain. Instead, use the anti-lock braking systems – ABS – which is perfect for icy conditions. (3) When the ABS is engaged just step on the brake, stay on it, and steer in the direction of safety. Considering the CSA penalties, loss or damage of shipment, and of course, the possibility of injury or fatality, just slow down. There’s too much at stake. Rushing a driver to make a delivery time is never the right decision. In the winter, the likelihood of an accident becomes more probable with poor road conditions, lack of visibility, a decrease in stability, tractions, and performance. In the winter, just be honest with clients and under promise and over deliver. For more information in the world of trucking check out the Rand McNally: Milestones.